Have you been advised to start Pilates by your Physiotherapist, GP or Consultant? Are you unsure what is the best option for you or where to start? There are two options with Pilates – Pilates on the Mat or Pilates on the Reformer (machine). They are both excellent ways to strengthen your core muscles which will help with your back pain or injury. Matwork is lying down on a mat and working your way though a low level of exercises to help strengthen the entire body while engaging your core muscles. Reformer Pilates is lying down on a moveable carriage. Here you will do similar exercises to the mat but you will work with a small bit of resistance. This can help make the exercise easier or a bit tougher if you need more of a challenge. With injuries or back pain you can start with either the mat or the reformer. 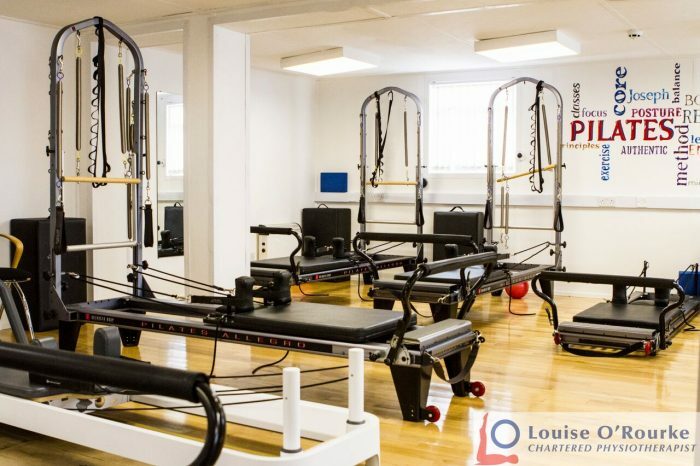 We offer a trial package for €20 to try a mat and reformer class to assess which one will work best for you. Then you can sign up to a 6 week course of your preferred type of Pilates. If you are unsure speak to your Teacher who will be more than happy to guide with the best form of rehabilitation for you. Another option is to do a private pilates session to discuss your goals. If you are new to Pilates you will start with a Beginners class. Pilates is a mind body exercise system aiming to develop optimal strength, flexibility, endurance and posture, without building bulk or stressing joints. It strengthens the deep stabilising muscles of the spine, the pelvic floor and the core muscles of the shoulders. 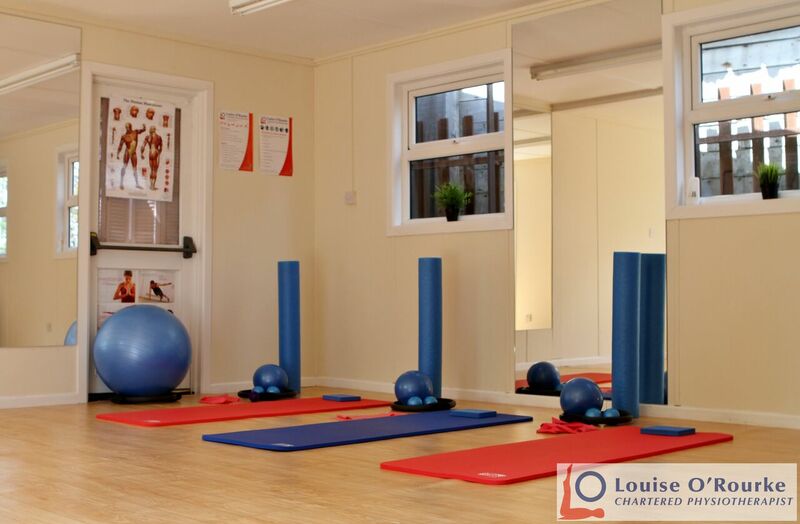 Your physiotherapist will take you through a series of exercises which will include the principles of Pilates. Most importantly it is an adaptable method and modification is the key to Pilate’s success with a variety of populations. All exercises are developed with modifications that can make a workout safe and challenging for a person at any level. The famous Joseph Pilates was unhealthy as a child suffering from asthma, rickets and rheumatic fever and therefore dedicated his life to becoming physically stronger. On his way to developing the Pilates Method, Joseph studied anatomy and developed himself as a body builder, a wrestler, gymnast, boxer, skier and diver. He became a nurse during World War 1 and trained other interns in “Contrology”. This was his system he developed which aimed at strengthening the human mind and body. Pilates believed that mental and physical health was interrelated. Joseph rigged springs to hospital beds, enabling bedridden patients to exercise against resistance. An influenza epidemic struck England in 1918, killing thousands of people, but not a single one of Josephs trainees died. This, he claimed, testified to the effectiveness of his system. This was where Pilates developed his many inventions including the Reformer, The Cadillac, Wunda Chair, Ladder and Barrels. After the War, he emigrated to America and opened a fitness studio in New York with his wife Clara. Their work became well known and they continued to teach and supervise students. They soon had regular clients including dancers, actors and athletes attending the studio for training and rehabilitation. If you commit yourself to a consistent workout schedule you will certainly feel results. How does Pilates enhance sports performance? Pilates can help improve performance of specific sport skills such as golf, skiing and hockey by improving core strength, balance and flexibility. Pilates focuses on good postural alignment helping athletes to function more efficiently. This reduces any unnecessary strain on their joints and muscles. The development of muscular balance between opposing muscle groups and around a joint also benefits the athlete. Pilates is effective as a part of an athlete’s rehab program because it is a non-impact but challenging workout.